Following a year’s more research about inflation, Pete Comley has now published a new book. It builds on Inflation Tax and provides a bigger picture understanding of inflation. In particular Pete has developed a new theory about the causes of inflation. Inflationary Wave Theory proposes that long-term inflation is created by population growth and competition for resources. Price increases depict a wave-like pattern over the centuries due to effects of man exploiting the inflation trend to such a point that prices eventually consolidate over a long period. The world is about to enter this stage of near-zero inflation. The new book examines how this transition might take place and the conditions that need to be fulfilled. It is likely to be accompanied by some form of deflationary shock. Investing over the coming decades will therefore be difficult and the book discusses the implications of it for future wealth management. You can buy the book on Amazon here or download a free Lite version of the first 7 chapters at inflationmatters.com. A full contents list is provided below. Pete was Simon Rose’s guest in Share Radio’s Book Value slot on the day that CPI was announced as dropping to below 1 per cent. Listen to the interview here. there are contractual commitments at stake. On the positive side, it is commended that ONS is having a discussion about inflation statistics. I agree with Johnson that it is complicated to come up with one measure and method that seems perfect. It also correctly highlights the limitations of CPI (or HICP – the Harmonised Index of Consumer Prices, as it was originally known). This measure was invented by the EU in 1996 purely as a method of comparing countries to determine their eligibility for joining the Eurozone under the Maastricht Treaty. It was never intended as a cost of living index that would be used by individual countries, as has now happened in the UK. HICP left out everything to do with housing costs – purely for the reason that EU members could not agree on how to measure it. It did not use weights based on the average person’s spending as these surveys were inconsistent across nations but instead used expenditure weights from the national accounts. This meant it was biased towards the expenditure of the rich. For example eating out counts 10% in CPI but just 5% in RPI, whilst alcoholic drinks is reduced top just 2% in CPI as opposed to 6% in RPI. It also used geometric means (see below) to combine together individual prices, as that method was coming in vogue then both for statistical arguments and also probably because it produced more consistent and lowers levels of inflation. This was handy to help members qualify under the Treaty conditions. In 2003 Gordon Brown decided to make it the main inflation measure that the Bank of England targets. One can only speculate why, though the fact that it is normally around 1% lower than RPI could well have contributed to that decision. That would mean it would make it look like the UK was meeting the inflation target more often than we did. In 2010, CPI started to be use to index pensions and welfare payments – again ensuring that these would be lower. Roll on to 2012 and ONS tried to convert using RPI to use geometric means. This would have saved the government £7 billion a year in gilt payments alone, which would have been very handy when the coalition was trying to trim the budget deficit. However the consultation failed. 406 organisations, statisticians and members of the public responded. Just two of the 406 supported the ONS’s plan to switch to using geometric means for all the RPI calculations. That was a massive rejection of the plan by those not involved in the ONS or the Consumer Prices Advisory Committee. Having failed to win the consultation, ONS immediately declassified RPI as an official statistic, leading to many jokes about RIP RPI. Clearly this subject has not gone away and ONS was back this week with another set of arguments, this time to attempt to permanently kill off RPI. The main one is that the Carli method used to calculate some of the prices increases in it is no longer internationally acceptable. Carli is used where there is a wide range of prices being combined. It involves taking the change in price in each store and then averaging these changes (as opposed to working out the average price across all stores and comparing it to last month – Dutot method). The key issue with Carli is reversibility. If prices go up and then come back down to the same level, you can get hypothetically end up with a price index that doesn’t go back to 100 (and is higher). The fact that this virtually never happens in the UK as prices nearly always go up and that the whole index is not price reversible is ignored, in this theoretical argument. Instead what CPI uses (and RPIJ) is a completely different type of mean score called a geometric mean – called the Jevon’s method. It has reversibility but comes with a couple of side-effects. Firstly it is a calculation that is so complicated that, in my view, fails a requirement of comprehensibility to the public. However more importantly, it nearly always produces a lower price increase than has been experienced by the general public in the shops. Statisticians dodge the latter by saying it is in fact estimating substitution effects. In their oft quoted example, they say that if the price of Romaine lettuce goes up, some people will switch to a cheaper Iceberg and Jevons takes this into account with its lower price increase. However quite how a geometric mean, which multiply prices together and taking the nth root of them, was supposed to measure the psychological dilemma of substitution was never explained. But more importantly, if the price of Romaine lettuce has gone up, it has gone up and that should be reflected in the price index. If people decide they can’t then afford it, that is a completely different issue. Furthermore such substitution effects are already fully being factored into RPI/CPI with their annual change in products being reviewed. No further adjustment is needed. Therefore contrary to Johnson’s report, there are actually quite a few reasons to stick with RPI, which avoids the problems of geometric means. Using the Carli method to combine mean scores might have its issues but so does using Jevons. They are just different ones. To me, a simpler solution for a UK price index would be to adopt the same approach as Germany and Japan, that is to just use the simple bog-standard Dutot average which has fewer flaws. ONS might argue that there is too much price variation to do that, but they just need to tighten up on the items being checked and make them more consistent. Saying to their price checkers to go find say “any ladies blouse” is open to a wide range of interpretations (and prices) and is just asking for problems. Johnson’s other main conclusion is that we should adopt CPIH as the UK’s main inflation statistic. I tend to agree with Shaun Richards that this is a complete embarrassment for the ONS. Firstly there are so many problems with CPIH that even the ONS have declassified it as a national statistic. However more importantly it does not solve the key problems with CPI. These are all included in the RPI measure and housing accounts for a quarter of the whole index weight, as they are so important in the nation’s spending habits. But no, in CPIH none of these are included. Instead it uses something called “rental equivalence” of the theoretical rent paid for an equivalent house as a proxy for the costs faced by an owner occupier. Not only is that a really odd thing to do, but it also only gives them a weight of just 15%. Even more strange is that this rental equivalence measure (whatever it is), always seems to end up with a very low number for inflation of 1% or less. Therefore even as UK house prices are growing at 8%, OOH is still just 1%. The impact of this is clear as the chart above shows. This means that far from CPIH helping to increase CPI because of higher house prices, it is actually serving to reduce CPI still further (by an average of 0.2% over the last 3 years). 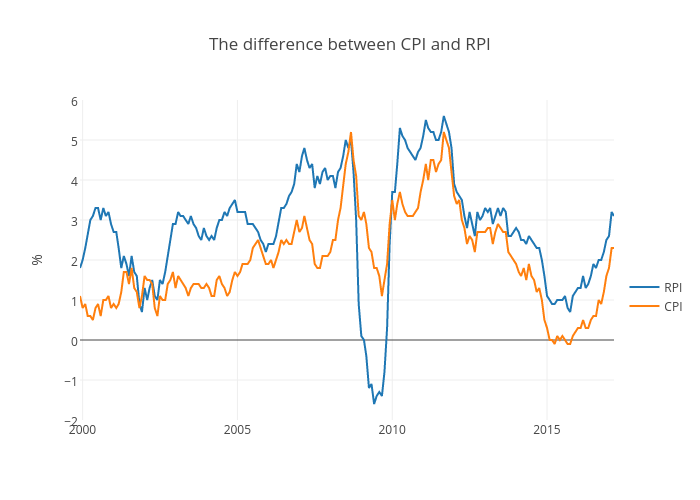 My personal guess is that CPI already underestimates inflation by around 1-1.5% in the UK. See Chapter 6 of Inflation Matters book (or download the Lite version here for free). Changing to the current CPIH would make that 1.2-1.7%. Therefore if CPIH was 2%, true inflation in the UK would be around 3.5%. I am reminded of the Economist headline a few years ago: “Lies, flame-grilled lies and statistics“. Also as they more recently summarised the issue as: “Statistical offices vary in their ability to resist political pressure”. Is the ONS finally beginning to crumble?